Have you ever thought if a museum actually comes to life? Have you ever slept over at a museum? Well St Marys have and read this article to find out more. 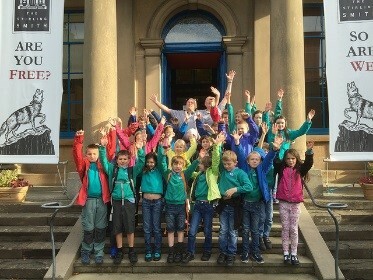 On the 22nd of September St Marys went to the Smith Museum for a sleepover. Our first challenge was to find something in the museum p1/2s had to find a jo b from the olden days or something that helped people to do a job and make a presentation about the object they chose. Primary 3/4 found something to do with the Romans and finally P5/6 had to find out about a person from the past who has helped Scotland. After all their hard work everyone had their tea sitting with friends and having a ball. To cool down before their last challenge they all watched Night at the Museum. Now we all went and got ready for bed, we brushed our teeth and washed our faces. Mr Smith organised a surprise activity in their pyjamas. P4s to 6s all found a partner and went round looking for numbers and letters and made it up into a word. Everyone was getting tired. Time for bed, that’s the real challenge going to sleep. It’s the next morning, time to get dressed. Breakfast was a croissant or a bowl of cereal, yum!